Until the 25th of December, players at All British Casino have the possibility to follow Gonzo (Gonzo’s Quest™) who’s dashing through the snow to lead you to the next great Christmas promotion as part of the yearly Christmas Advent Calendar. 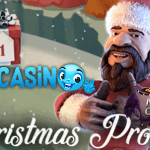 With another 10 windows to be opened, you can still enjoy lots of Christmas Casino offers including today’s no deposit free spins for the Secrets of Christmas™ slot. What started already on the 1st of December will continue until Christmas day. This means that you still have an amazing 10 Christmas Advent windows to open until the 25th of December. Every day again The Gonz leads you to the next window presenting what Santa has left behind at All British Casino for all loyal players. 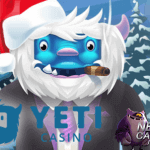 Some of the Christmas offers involve a generous casino bonus, a cash back offer or a free spins offer that involves a deposit. 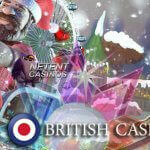 Today, though, there’s a focus on the loyal players with 12 no deposit free spins available for this group of players at this British NetEnt Casino. Of all three Christmas slots developed by NetEnt, I definitely prefer the Secrets of Christmas™ slot in which you’ll be treated a traditional Christmas. The Secrets of Christmas™ slot is offering a great Christmas atmosphere, bringing you the perfect Christmas spirit filled with joy. I’m sure you’ll appreciate all traditional aspects of Christmas which can be found on the reels such as the garlands, the golden church bell, the Christmas stockings, candles, and the Coca-Cola type of Santa Claus. 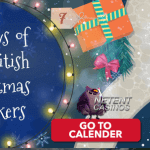 The Gonz bumped into this Christmas-themed NetEnt slot a few times already since the start of the Christmas Advent promotion at All British Casino on the first of December and now again you’ll be able to enjoy no deposit free spins for the Secrets of Christmas™ slot. At least, if you belong to that large group of loyal players. And loyal doesn’t mean you’ve been playing every single day, but it does mean you have been active in the past 30 days with at least one deposit made in the past month. If you’re a loyal player, you’re lucky today! Let Gonzo lead you to present number 15 in which you’ll find 12 free spins, worth an attractive £0.20. 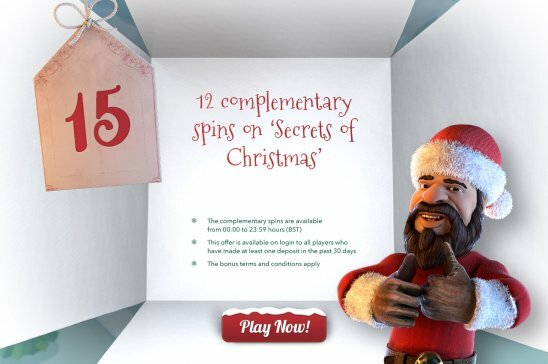 These 12 no deposit free spins will be available straight away and I’m sure you’ll enjoy the many attractive slot features available in the Secrets of Christmas™ slot while getting into the Christmas spirit. 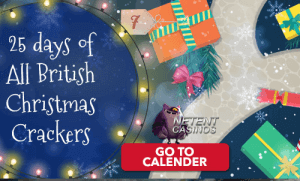 If you haven’t been loyal enough to All British Casino, you, unfortunately, miss out on today’s Christmas Advent Promotion. To make sure you don’t miss out on any future promotions up to Christmas that involves your loyalty, you better make a deposit as soon as possible. If not a player at All British Casino yet, you certainly have nothing to be sad about as you can look forward to a very generous welcome offer including a huge 100% welcome bonus up to £100 and a massive 100 free spins for Starburst™, Pyramid™ or Aloha!™. Christmas is all around!